Now, a band that you have probably never heard off. I love introducing such bands, however, I’m hoping deep down that someone will find this name a bit familiar, or at least those who are oriented in the genre this band plays in. 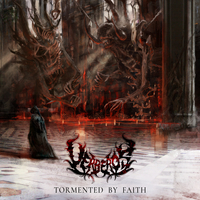 This is another great Polish score and is the self-released debut album by UERBEROS, entitled “Tormented by Faith”. Although we’re a bit late to the party, I knew about this album a few days after its release - thanks to a friend; and there are absolutely no regrets. This might be a debut, but it’s a bombastic one. It’s a rare thing that such an album can drop and have such a gigantic impact on the Technical Death Metal scene. This being their sole record ( consisting of 10 songs) the band have a blank sheet of paper to prove themselves in the book of genres - or the book of the Metal - and they filled it out pretty right with some tight riffs, on-point vocals, furious drums and nasty bass lines. What you’re about to hear is quite certainly one of Poland’s greatest current Technical Death Metal bands – and if not, they will be in the future; I can guarantee you that. Although this was their debut album, it definitely gained some popularity - being reviewed here and there - and I must say, this one is a must if you’re a fan of brutal Technical Death Metal, done in the vein of more up-tempo IMMOLATION, MORBID ANGEL, TRAUMA, HATE - basically Death metal done in a blackened and fastened touch, being kind of deformed from its original shape, just to become something even more fantastic and unique. Put your hands up for this tight band and please, give them a listen, you won’t regret it!